Royal Mail pride themselves on providing a reliable and up to date tracking service for customers who send mail using their Track & Trace service. Each item sent via one of their trackable mail services comes with its own unique reference number, which can be entered online in order to track its progress. Exact times and destinations are given, and the signature of the receiver is often viewable online shortly after the letter or package has been successfully delivered. Confirmation of delivery is also available with Royal Mail Signed For, though this does not feature tracking details in full. Royal Mail Special Delivery Guaranteed and Royal Mail Tracked 24 and 48 are the domestic postal services which are fully track-able, International Tracking and Signature services are also available. International Tracked & Signed includes full tracking and a signature on delivery, International Tracked gives tracking at five points and confirmation of delivery, and International Signed tracks the item while it is still in the UK then provides proof of signature on delivery in the receiving country. Both the sender and the intended recepient are able to track items using the reference code. Tracking numbers must be kept in a safe place, as once lost, access to the service is unavailable. 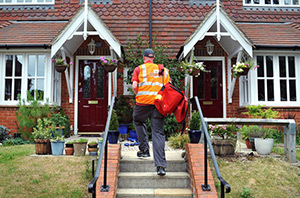 Royal Mail is the UK’s official designated Postal Service Provider. The company Royal Mail plc was established in 1516, though it was not until 1635 that its services were made available to the public. For much of its history it has been a public company operated by the government, until the Postal Services Act 2011 came into place and, in October 2013, 700.000 members of the public purchased shares in the company when it was floated on the London Stock Exchange, formally making it a private company. Though the government maintains a share in the company, 70% of it is owned by shareholders who ultimately have the biggest say in what goes on and how it is ran. The Royal Mail Group submits regular regulatory financial statements to Ofcom, where the companies detailed financial accounts and reports can be examined. These contain cash flows, costs and business reports. More summarized accounts can also be viewed online. As of 31/03/2014, the companies revenue was reported at 9,456.00 million (GBP), with profit after tax totaling 1,280.00 million (GBP). Royal Mail are dedicated to the community and have a Community Support Scheme to help charities and local communities in need of aid. Each Royal Mail employee is entitled to apply for up to £200 each per year for contributions to registered UK charities or registered good causes under the scheme. Royal Mail’s official charity partners are the Alzheimer’s Society and Whizz-Kidz, who they regularly donate to. They also select a Charity of the Year for whom the group collectively fund-raises money for over the period of two years. Their current charity is Prostate Cancer UK, for whom they are aiming to raise a total of £2 million. Shares enable members of the public to invest in a company and grant them a degree of ownership in it, depending on how much is invested. This gives them certain rights and power within the company, and gives them the opportunity to influence decisions. Royal Mail share prices are constantly changing and are affected by a number of factors, such as the companies current profit and market share. Full details of the current Royal Mail share price can be viewed and tracked online. Shares in the Royal Mail plc are available to purchase and can be managed and monitored using the Registrar Equiniti provided by the Royal Mail website. Here it is possible to find out the value of shares with a share valuation, change the name the shares are registered in, change an address when moving house, transfer shares to another person, pay out dividends, access documentation relating to the shares online and file a report in cases where share certificates are lost or misplaced. Royal Mail constantly update their prices both for personal customers sending regular mail and business customers using special postal services. As well as making adjustments to the prices, they also frequently change the specifications of what can be sent and for how much, for example the dimensions or weight allowance of a package or letter. As of June 2014, their key prices for domestic and international mail are as follows. The prices for personal customers sending regular mail are different to those for business customers sending mail en mass on a daily or regular basis, and the prices for businesses vary in themselves too depending on how the postage is purchased, for example using a franking machine, online postage or regular stamps. This option is only intended for letters that need to be sent with utmost urgency, and offers good compensation should the company fail to meet their delivery promise. There are several different options available for sending mail abroad, and prices vary depending on which Zone the country the mail is going to falls into. The Royal Mail splits prices up into three categories: Europe, World zone 1, and World zone 2. For businesses that use Stamps, Online Postage or SmartStamp, special discounts are automatically applied to help cut down their costs and encourage the use of the Royal Mail over external courier services for the shipment of parcels and packages. Business prices for sending letters and parcels to Europe or World zone 1 and 2 are the same as the prices listed above for personal customers. Business customers using a franking machine prices are worked out in a different way, with a 19% discount applied to letters sent by 1st class standard mail and 30% on 2nd class standard letters. The prices charged for small packages are also significantly lower, starting from £2.50, as are prices for international mail, as letters to Europe, for example, frank as just 85p. One of the main features available on the Royal Mail website is their postcode finder, which enables anyone to type in either a full postcode or part of an address and then comes up with full address matches instantly. 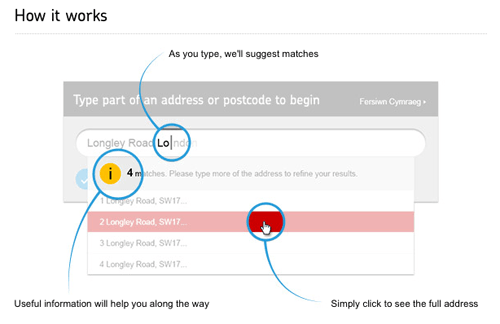 To save time, the postcode finder also automatically pulls out suggestions, as to what the address might be while the person begins entering the address or postcode. This means, it is possible to obtain someone’s full address, including the postcode. In result, the mail can then be sent, even if only the first line of it is known. The Royal Mail online shop is intended primarily for businesses and offices who need to order mass mail supplies, with many items catering for their needs available, such as super saver packs of envelopes, rolls and sheets of stamps, mailing boxes, prepaid envelopes, postal stationary and postage labels. It also has a large range of goods available to the regular customer, including many gifts and collectibles related to the postal service. These include collectible stamps featuring unique designs and images, special stamp collections, pin badges, home ware and more. There also sell customisable post and go stamps and a variety of stamp collecting accessories for hobbyists to help enhance their stamp collecting experience and keep their stamps safe, protected and in prime condition. They also sell cardboard boxes, wrapping and packaging for those moving house or office. 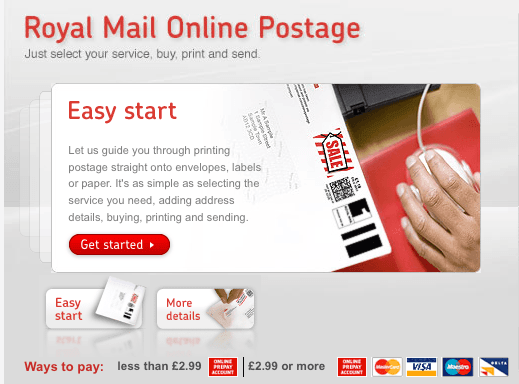 As well as a host of physical products and stamps, the Royal Mail online shop also gives regular customers and businesses alike the option to select, purchase and print their postage services online, and includes a price calculator which shows the price before the transaction is completed. This then means the item can be posted without the need to go to a post office, with the exception of signed for mail or anything that needs proof of posting, as these require a stamp or signature from an official staff member. 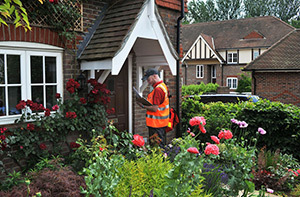 As much of Royal Mail’s postal services require a signature for proof of delivery, often times letters and parcels are undeliverable if the receiver is out when delivery is attempted. This is also the case with regular mail when the package or letter is too big to fit into someone’s letterbox and there is no secure safe place in which to leave it. A small card is generally left by the postal delivery person stating details of the recipient, the item itself and with instructions of how to pick up the item from the nearest sorting office or arrange for it to be delivered again on a nominated day. The redelivery is bookable through the Royal Mail website, and is free of charge when booked to be delivered to the same address again or to another address that falls in the same postcode area. For a small fee, it is also possible to arrange for the package to be delivered to the nearest Post Office branch in cases where the delivery office is out of the way. To book the redelivery, the receiver must fill in the date on the ‘Something for you’ card left, their name and address and the specific barcode number on the card if there is one, so that their mail can be identified. Mail that is undeliverable is kept for 18 calendar days before it is sent back to the original sender. For inland mail to the UK that needs to be sent urgently and for which next day guaranteed delivery is necessary, Royal Mail offers a premium special delivery service that ensures delivery of the item by 1pm of the next day. Unlike other Royal Mail services, this also includes Saturdays. With the Royal Mail Special Delivery service, customers are able to track the mail online as soon as it has been processed, and once delivered, they can view proof of delivery and a signature for absolute reassurance. If valuable items, for example expensive gifts or jewellery, are being shipped via the service, compensation cover is available. For an additional fee, consequential loss cover can be purchased, meaning that if Royal Mail fail to fulfil their delivery promise and the customer incurs charges of some kind as a result, for example on official documents such as tax returns, they will cover the costs. The cost of the postage is also refunded in any cases where the delivery misses the deadline, and this is a guarantee that comes with the service, for which there is no additional cost. When people move house or office, one of the biggest hassles is updating contact details and addresses with all companies, customers, friends and relatives. Ensuring that every bit of mail is sent to your new address and that nothing is sent to the old one is an impossible task, and it is inevitable that within the first 3 to 12 months of any move, mail will still end up going to the old address. This can include important documents, bills or personal letters and goods, and so many people like to have the mail redirected to their new address to save any worry and reduce the risk of potential identity theft or privacy invasion. This is especially so in cases where they have moved too far away from the old address to make regular collections and checks themselves. Royal Mail therefore offers a redirection service that quickly redirects mail sent to an old address in the customer’s name and instead delivers it to the new address. In order to benefit from this service, customers must specify their full name, birth date and address details and must also have a credit or debit card registered at the old address from which the mail is redirected. The redirection service is available for a minimum of 3 and maximum of 12 months and costs from £24.99 per surname. It would cost, for example, the same amount for a whole family with a shared second name to redirect their mail as it would a single person. The service can be booked up to 3 months before an official moving date, so no mail is missed out or left to go astray. Redirection is limited to a time period and you can request a renewal for an existing redirection. The first letter includes a renewal code and PIN code, which is required for a renewal of the redirection service. It is not a difficult procedure. All the data is already with Royal Mail, so the renewal is actually a simple process, that one can do any time before ending of the booked redirection. You can visit the redirection service website for more details. In some cases Royal Mail will leave you a special, so-called „Pay a fee“ card. This means that an item for you will require a payment of fees. It could also mean that the sender didn’t pay the whole postage fee or that there is customs charge for the shipment. In case you received this letter, you can visit the designated ParcelForce website, on which you need to type in the reference number and pay the fee online. 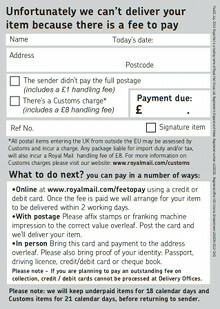 You can also register with Royal Mail and pay the fee directly on the website. Fees can also be paid in the stores in person, depending on the individual taste. Royal Mail have a customer service team that works to look into, deal with and ultimately resolve, customer complaints. They currently promise customers a response within 30 days of receiving the complaint, though this is not always possible due to the amount of enquiries they have to deal with. Complaints that concern international mail can also take longer than the normal 30 days as they require the input of foreign administrators. For more complicated cases that may require additional correspondence with the customer, resolution of a case and any reimbursement can take up to 90 days. Customers are able to file formal complaints online, by letter or by speaking with a Royal Mail advisor on the phone. Forms for specific complaint, for example Loss, Delay or Damage claims, are available to download through the website, or they can be picked up from any post office branch. Detailed information is required to deal with any complaints and claims, and proof of an item’s value is requested for reimbursements or compensation to be granted. The complaints handling process can typically be divided into three to four stages, depending on the outcome and how satisfied the customer is with the service and resolution of the case. The first step (1) entails the customer contacting the Royal Mail Customer Services Advisors, who provides the initial response. If unhappy with this response, the customer must escalate the case (2), which is then re-investigated by the Customer Resolution Team. If dissatisfied with their response, the customer then has the option to take the complaint further (3) to the Postal Review Panel, whose aim is to come to a mutual agreement that is satisfactory for both parties. If still unsatisfied with the outcome, customers can further escalate the complaint to the Postal Redress Service (4), an independent company, though this is only available in exceptional cases. Full details of the procedure can be read here. Businesses that use Royal mail services are now able to register a special account online to purchase mail and to make managing their financial accounts and monitor spending easier. The Online Business Account is straightforward to use and simply requires sign up to create an account. Through it, businesses can see exactly how much they are spending on postal services, all in one place, and can identify mailing patterns and analyze available data to attempt to cut down the costs and improve their overall cash flow. It also shows invoices in full online and makes accessing old ones easy. Should a business wish to contest an invoice or raise a query regarding a detail on any invoice associated with their account, they can do so online. There is an OBA help desk available, which is contactable by phone, to assist businesses with their account and any questions they might have. Trained advisers are at hand to make everything run smoothly, and can assist with technical queries regarding the service itself, for example run through how the OBA can be integrated with a business’s own system. Video tutorials are also viewable on the website, along with a demo that shows everything in action, so that businesses interested, are able to get an idea of how it works before signing up. The manager of the account can have sole access, or they can grant as many additional staff access as they wish. This means that the manager can enable the inhouse mailing office to have the ability to quickly purchase mail services on their behalf, then view in depth details and invoices at the end of the working day, week or month. There are a total of four different reports available, including overview reports, which detail volume and sales summaries, sorting them by account and products, invoice reports, for billing dates sales order and service information, and sales order reports, which contain full sales order information. There are many jobs available at the Royal Mail Group, and although the roles of postman and postwoman are most common and thus the most visible, the kind of work on offer is actually varied and multifaceted, with jobs that will appeal to many skill sets. Examples include administration jobs, drivers, engineers, financial staff, security, technicians and technical advisers, human resources, data input, maintenance and graduate positions for those fresh out of University. Jobs can be found using the Royal Mail job opportunity search service, where job sectors and location preferences can be specified, and which also allows people to submit applications for jobs that appeal to them. Royal Mail provides their staff with extensive and intensive training to prepare them for the work and puts great emphasis on safety and security in the workplace. Many of their roles have career options, with good salary increases, bonuses and rewards for long-term staff. They also come with pension arrangements and benefits, also known as the Royal Mail Defined Contribution Plan, offering good job security with a view for retirement and the long term. Royal Mail is keen to employ skilled and knowledgeable graduates straight out of education and have many graduate programs available to train them and prepare them for a future in the company. These focus on pivotal roles within the company rather than regular postal jobs, in departments such as Operations, Engineering, HR, Technology and Logistics. Royal Mail created an information page for those interested in the jobs, which answers the most frequent questions. As so many people try to contact Royal Mail on a daily basis regarding a plethora of issues, they have divided up their team who are contactable via a variety of different methods. Customers are advised to consult the FAQ sections of relevant parts of the Royal Mail website to see if their inquiries have been dealt with already before making contact directly, in order to speed up overall customer service and response. For those, who have questions with relation to moving home or going on holiday, the number to call is 03457 777 888 within the UK, or +44 1782 668 007 outside of the UK. There is also an online form for queries, and the opening hours are 8am – 6pm Monday to Friday, and 8am – 1pm on Saturdays. Those in need of assistance with online postage can call 0345 611 3425 or email onlinepostage@royalmail.com, opening hours Monday to Friday 8am – 5.30pm. Online shop contact details are 03457 641 641, or (+44) 1752 387112 outside of the UK. Questions can also be emailed to philatelic.enquiries@royalmail.com. My Parcel estimated delivery 08:15 friday 26th may 2017, funny the postwoman came and went at 9:30 with no parcel for me, she has already damaged one item delivered to me last friday, when i spoke to her about it she couldn’t care less and blanked me, so i had to order a new one, which was due for delivery this morning and hasn’t arrived, and cannot be tracked on your system, tracking number FP751874395GB, this is a disgrace she’s a disgrace cause she couldn’t be bothered to knock on the door and deliver the item by hand, so she posted it through the letter box 6FT off the ground onto a hard surface, and damaged the internal struckture of the item, i hope your satisfied with the ignorant people you have working for you. This “service” is the worst I have ever encountered. After wasting half an hour of my time trying to track one parcel I have given up. I did not go to your site to fill in pointless surveys about services you are unable to deliver or repeatedly enter a number that does nothing but take me back to repeat the process. What is the point of this service? as it gives no tracking information. Another gimmick by Royal Mail to give the appearance that it has indeed evolved from the dark ages. 2 minutes of my life, that I ain’t getting back. I can’t track my letter KP815683299GB . Im only presuming that your company delivered a package on behalf of USPS.COM Tracking number LZ185556620US to 43 Ashwood Avenue, Wordsley, Stourbridge, West Midlands DY8 5DF on November the 3rd at 07.11, however Im told that it wasnt. I have tried many times to contact USPS but how the hell you do through their website is a joke so I would be most appreciative if you could help me find this delivery for my daughter as this has hapenned twice now the delivery was said made and it hasnt. I expected a little more than”in progress” from the system,other parcel firms state where parcel actually is on the journey. This site doesnt work. They ask for your reference number and then you hit search but they don’t give you any information on your parcel accept for a long page of information on stuff you dont need. Dont enter your reference number it dont sound right to me.